Augusta, GA – Gerda “Rose” Mongan, 89, entered into rest Wednesday, March 20, 2019. Memorial services will be held Saturday, March 23, 2019, at 2:00 PM from the chapel of Chance & Hydrick Funeral Directors with Reverend Wayne Todd officiating. 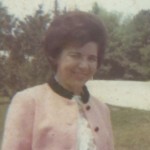 Mrs. Mongan, a native of Germany, was a member of Sherwood Baptist Church, where she taught Sunday School for many years. She retired from King Mill. She was preceded in death by her son in law, Thomas Edgar. She is survived by her daughter, Ruth M. Edgar, of Augusta; her grandchildren, Barbie Albino (Rick), Patricia Gregory, Bobby Edgar, Nataisha Edgar, and Crystal Edgar; and her great grandchildren, James, Tyler, Ava, Morgan, Zion, Gunner, and Ivy Rose. The family will receive friends Saturday from 1:00 PM until the hour of service at the funeral home.